This is www.hcmusic.org, the official website for the Hinsdale Central High School Music Department. Here you will find the most current informatizon about the music program. Use the linked navigation boxes above to explore. The study of music involves participation, discussion and performance of musical works that have artistic and historical importance. Each student will strive to develop his or her own skills to the highest possible level. In support of these ideals, we endeavor to create quality large ensemble performances, study music of historical significance, rehearse separately and together to develop expertise, establish relationships that foster understanding, discover the relationships between music and culture, and become lifelong musical learners. 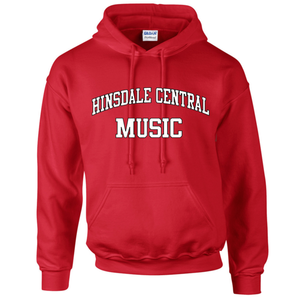 The Web Store, https://store.hinsdale86.org/ is the place to purchase equipment, performance attire, and pay to join the Music Parents Association (MPA). It's now time to sign up for Rome! The Red Devil Marching Band received an invitation to perform in the New Year's Day Parade in Rome, Italy, on January 1, 2020, and the school board recently approved the trip. If you are currently in 8th, 9th, 10th, or 11th grade and in band, you are invited to participate. Hinsdale Central's bands have historically traveled every other year and alternate between a less expensive, long weekend trip and a longer, more costly destination like this. The trip is largely all inclusive, will run from December 27, 2019, through January 3, 2020, and is currently priced at $3515 per person for double occupancy rooms. Chaperones will have the option to pay additional for a single room. You can look through a Sample Band Itinerary, for more information about sight seeing and meal options. Payments are due in the Web Store as follows: $495 by 3/1/18, $755 on 4/15/19, 5/31/19, 8/15/19, and 10/15/19. The first $100 is non-refundable and all other payments are non-refundable after 5/1/19. The cost of the trip includes trip insurance. Web Store payments are free if you use an electronic check through your bank; however, they charge a 3% fee for using credit cards. If you are interested in joining the band as a chaperone or if you have multiple children participating in the trip, pay for each person separately. If you filled out our Google Interest Form, you are not enrolled in the trim. Making a payment in the Web Store is the way to officially register. On Thursday, March 7, Hinsdale students, with Bob Rogers Travel, will host a shared concert with the touring Duxbury High School band, choir, and orchestra. The band and orchestra concert will begin at 8AM and finish at 10AM. Students will then enjoy some time together to visit. The choir will be sharing their music later in the day beginning at 11:45 and enjoying lunch together. The video was shot on our phones and edited by Alex Shepardson and Zach Kanjirath. Now that we have had a little time to digest our London experiences and catch up on sleep we want to put together a few final thoughts about the trip. If you participated in the trip, please take a few minutes to fill out our own LNYDP 2016 Google form as well as the Youth Music of the World Survey about your experience. The Hinsdale Central Jazz Ensemble recently performed at Mullen's Bar & Grille in Lisle along with the Pete Ellman Big Band. Thanks to Pete Ellman and Ellman's Music for providing the performance opportunity and to Mullen's for hosting an outstanding event. The Performing Arts Calendar has been entered into Google. You can sync it to your phone or desktop and always access it through our website. Click on the Google logo and use your personal Google account to open a full page calendar that you can customize. Or just click on our Calendar link. Jazz classes will begin on Tuesday, September 4, 2018 with an A Day: Jazz Band and Ensemble. Jazz Lab Information meeting will be on Wednesday, September 5, 2018 at 7:00AM in 167. If interested, fill out the Jazz Lab interest form. The early bird classes meet every-other-day from 7:00 to 7:50 am on a two-week rotating schedule. On designated Monday late starts, early bird will run from 8:00 to 8:40 am. On Tuesday, October 9, 2018, over 100 Hinsdale Central High School music students, along with several thousand students from other District 1 schools, auditioned for the Illinois Music Educator Association (ILMEA) Bands, Choirs, Orchestras, and Jazz Bands. Based on the results of those auditions, 42 students were invited to participate in the Jazz Festival on Saturday, November 10, at Hinsdale Central High School, and the District Festival on Saturday, November 17, at Oak Park River Forest High School in Oak Park, IL. The top seated students at the district festivals, in bold below, were invited to participate in the All-State and Honors ensembles during the Illinois Music Education Conference (IMEC) January 24-26, 2019, in Peoria, IL. Please join me in congratulating the students listed below as well as the band directors, Matt Goeke and Matt Kurinsky, the choir director, Jen Burkemper, and the orchestra director, Serge Penksik. Congratulations to the Concert Percussion Ensemble, Symphonic Percussion Ensemble, and Wind Ensemble percussionists on their combined acceptance to perform in a demonstration clinic at the Illinois Music Educators Association’s (IMEA) Illinois Music Education Conference (IMEC) in the Peoria Civic Center at 3:45 pm on Friday, January 24, 2014. This conference is hosted by IMEA, part of the National Association for Music Education (NAfME), whose mission is to promote and support music as a vital component in the complete education of every child. Each March, IMEA accepts applications to perform and present at the next year’s “All-State” Conference. Applicants must submit recordings of two music selections as well as respond to questions about the program, department, school, and surrounding community. A panel of music educators not affiliated with IMEA judge the recordings, which are anonymous and do not contain school identification. Several schools or presenters in each division (band, orchestra, choir, jazz, and general music) are selected to perform as featured ensembles or present clinic sessions at the annual conference. Selected ensembles perform a 30 minute concert or 60 minute demonstration clinic for an audience of music educators. IMEA does not operate as a competitive organization. Therefore, being selected as a featured ensemble for the IMEA “All-State” Conference is one of the highest honors that a high school ensemble can receive in Illinois. Many music educators consider it “winning the state title” for the year. Director Matt Kurinsky and Associate Director Matt Goeke are proud of the growth of the Hinsdale Central percussion students and the music program. They feel that this recognition highlights the exceptional musicianship of their students, the overall excellence of the band program, and the great amount of support provided by the administration, school board, and Hinsdale community. The demonstration clinic will be an opportunity to share the successful aspects of our percussion program with music educators from across the state.